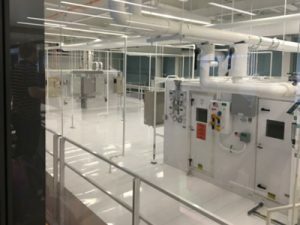 A CLEANPAK complete air distribution and filtration cleanroom system from Nortek Air Solutions is a vital component in the University of Illinois Electrical and Computer Engineering (ECE) Building, recently named R&D Magazine’s 2016 Laboratory of the Year. As the recipient of the Lab of the Year award, ECE was recognized for its status as a teaching and research facility designed to promote interdisciplinary interaction in a net zero-ready facility. The 230,000-square-foot facility on the Urbana campus of the University of Illinois consists of high-tech instructional classrooms, 21 labs, student lounges, an instructional cleanroom, student organizational offices, 11 teaching assistant meeting rooms, study rooms, faculty offices, and a 400-seat auditorium. It was designed and constructed to set new standards in building energy use and invest in renewable energy, including a planned solar array. As a result of its innovative design, the ECE Building uses 50% less energy than the minimum building energy efficiency standards established in ASHRAE Standard 90-2007 – what the architectural and engineering designers on the project, SmithGroupJJR, called “an exceptional achievement considering the energy-intensive nature of a laboratory building containing an instructional cleanroom.”When it came to the cleanroom in the ECE, SmithGroupJJR selected the CLEANPAK system based on their positive experience of using CLEANPAK on previous laboratory projects. The CLEANPAK system is a product offered by Nortek Air Solutions. The CLEANPAK cleanroom system at the ECE Building includes Recirculation Air Handlers (RAH) using Nortek Air Solutions’ patented FANWALL TECHNOLOGY® features for air handling systems to supply the large volume of distribution air for the cleanroom. Additional benefits include reduced noise levels, consistent airflow, and improved energy efficiency and redundancy for reliable operations. The RAH units sit directly on top of the laminar flow plenums. The supply air plenums include HEPA filters (High-Efficiency Particulate Arrestance) installed in Nortek Air Solutions’ patented gel-seal, flush-light ceiling grid system. Gel seals incorporated in this system help to prevent leakage around the HEPA filters. The plenums also incorporate fire sprinkler systems. Screens below the HEPA filters enable laminar flow throughout the cleanroom. In addition to the Lab of the Year award, the facility’s design and construction is on target to achieve LEED® Platinum certification and receive an EPA Energy Star® rating of 99 on a 100-point scale. CLEANPAK is a brand of Nortek Air Solutions. Nortek Air Solutions’ CLEANPAK local representative on the project was Mechanical Sales, Inc. KJWW, headquartered in Rock Island, Illinois, served as the mechanical engineers for the project. Nortek Air Solutions, LLC, offers the innovation and expertise of the largest group of custom heating, ventilation, and air conditioning brands in North America for commercial, industrial or institutional indoor environments. Nortek Air Solutions includes the following industry-leading brands of HVAC solutions: Governair®, Huntair®, Mammoth®, Temtrol®, Venmar CES™, Ventrol® and Webco™. Learn more about Nortek Air Solutions at www.nortekair.com. Nortek Air Solutions’ CLEANPAK system provides a complete air distribution and filtration system using Recirculation Air Handlers units which sit directly on top of the laminar flow plenums, as shown on the mezzanine view of the air handler portion of the CLEANPAK system in the University of Illinois ECE Building. They are equipped with Nortek Air Solutions’ patented FANWALL TECHNOLOGY features for air handling systems to supply the large volume of distribution air for the cleanroom.